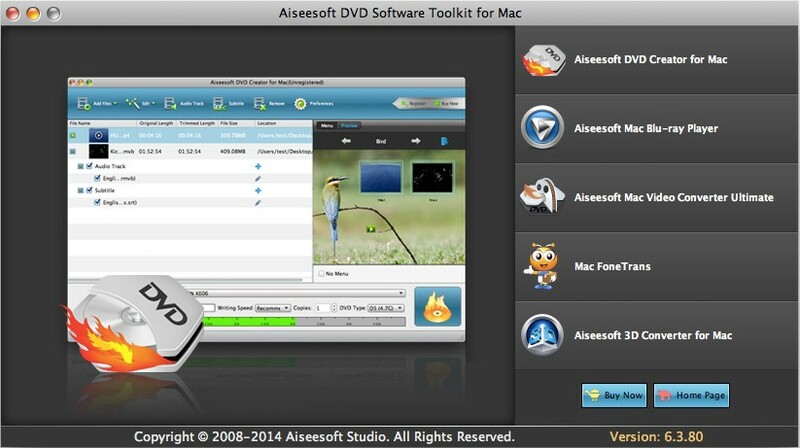 Aiseesoft DVD Software Toolkit for Mac is bundled of Aiseesoft DVD Creator for Mac, Mac Blu-ray Player, Mac Video Converter Ultimate, Mac FoneTrans, and 3D Converter for Mac. You can use it to rip homemade DVD disc and convert popular video/audio files to any other video and audio formats, such as H.264, AVI, MP3, WMV, WMA, FLV, MKV, 3GP, etc, transfer videos, audios and photos between iPhone and Mac, play blu-ray movie, burn dvd disc and convert video from 2D to 3D format, etc. After updated, it supports iPhone 6s/6s Plus/6/5S/5C, iPad mini 3/2 and iPad Pro/Air 2 now. The included Mac FoneTrans can transfer data bwteen iOS device and Mac with fast speed. It can also transfer files between any two iOS device without any loss. It is possible for you to trim any duration of your DVD or video to be converted. Besides, removing black edges is as easy as pie. You also can get any play region of the video by clicking "Crop". Just like the literal meaning of the option -- "Merge into one file", once you click, you can easily merge several contents into one. Adding what kind of pictures or texts for your video totally lies on your preference. 2016-10-10 6.5.20 Support the latest iOS device.